I was blog hopping and saw this beautiful Twisted Easel Card at Marti's Essence of Paper blog. That link referred me to Margaret's I Love Crafting blog to view her video on how to do this A2 (4.25x5.5) easel card. After I watched the video, I had a picture of what I wanted to post here. A simple picture tutorial for a quick fold A2 Twisted Easel Card. I want to thank both Martie and Margaret for inspiring me and teaching me how to do it too!! 1. Trim a piece of white 8.5"X11" cardstock to 8.5"X9.75". 2. Cut that into 2 pieces of 4.25"X9.75". Now you have enough for 2 card bases. 3. 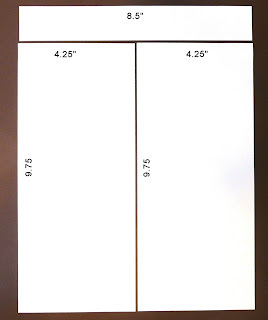 Score your piece at 5.5" on Score-Pal, leaving one end as 4.25"X4.25" (a square). 4. 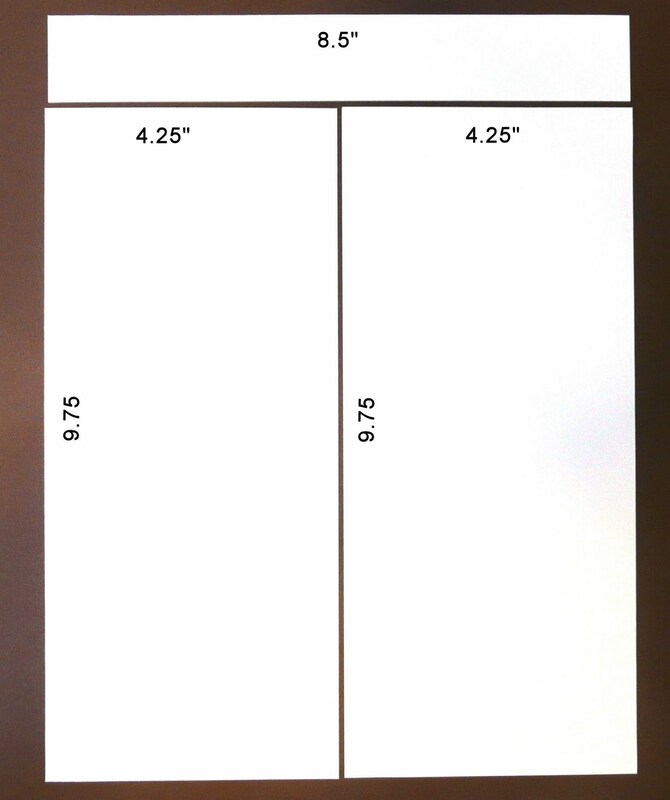 At the 5.5"X4.25 scored line, line your piece diagonally and score point to point as shown, on the 4.25"X4.25" side. Fold the corner on the upper right to the bottom left of the same 4.25"X4.25" square and it will make a triangle when you fold it. 5. Unfold the corner and turn the card so it is folded like above. The unfolded square will be on top and the 4.25"X5.5" rectangle will be on the bottom. Tape the bottom right-hand triangle as shown. Stamps - Hero Arts - CG115 Thank You; Impression Obsession B3568 Thinking Of You (Red Rubber) or All Occasion I (Clear Stamp Set) and Cover-A-CardTM CC008 Thick & Thin (Red Rubber Cling 5.75"X5.75"
Card Stock: Neenah Classic White Solar Crest 80lb. Accessories - Michaels Ribbon, Making Memories Heat Pin, Mark Richards Pearl stickers, faux dew drops from the florist part of Michaels. 7. Look at the image in STEP 5. Place your card front directly on top so it covers the whole square and rectangle and press down. Lift up the top from the right hand side and it should look like my card at the top. A. (You need to decide what you are going to use to stop the Card Front after it is opened - Buttons, Pearls, Cardstock on Pop dots, etc.) I wanted to leave enough room so I could write a short message. I decided to use part of the main image. I opened the Cardfront until the bottom left and corner was even with the base top edge. I marked along the bottom of the cardfront (lightly) with a pencil. The pieces were mounted with glue as shown and the line erased. Honestly, putting this tutorial together was more work than the card. LOLOL Then Google took everything down and I was ready to pull my hair out!!!!! Yesterday, around 4 pm, I sent them a message with my site address and in about an hour it was back. Don't think I didn't thank them. Another thanks to Marti and Margaret for their inspiring me. I hope you try this. It really is a cool and fun fold. Thanks for stopping by to look and say hi! WOW! Love your beautiful card and you know I am going to have to try this fold now. :) So happy that you shared the tutorial too! Beautiful card Shirley and great instructions also. I love those bright pinks. GORGEOUS Shirley! Great tutorial too! What a fun easel card Shirley! a different size than the one I learned from SCS - This is so pretty! thanks for the great tutorial! 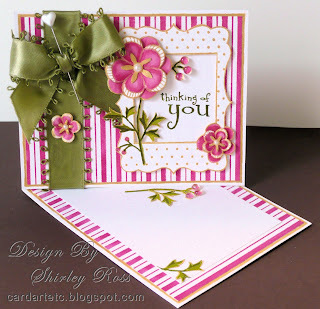 Thanks for the detailed tutorial for the twisted easel card, Shirley....your card is gorgeous!!! The flowers are beautiful and I just love that awesome green bow!!!! Shirley, this is one gorgeous card...love the colors and great tutorial!! Thank you for the shout out, I just love your card, great job. Whew now that looks stunning Shirley! Sometimes I do think "why?" about twisted easels but this really works. Beautiful! Wow! Wow! Wow! Shirley, this creation is a stunner! I love everything about it - the design, colors, embellishments - absolutely gorgeous. I am going to have to try this technique. I have not seen it before. Thanks for the tutorial. have a great day! Your card is amazing, but I am not surprised as all of your cards make me gasp as they are so pretty. Your tutorial is great too. I am going to give it a try sometime soon. I also want to say that I think that you are so thoughtful to always take the time to comment on so many people's cards. This card is just beautiful- I LOVE pink and the image and papers you used. Miss seeing you around at TJ! I meant to thank you for the tutorial when I was here the other day. I may have to try one of these sometime. Yours is amazing! I have GOT to try one of these! This is awesome Shirley! Cute card - will have to try it out, thanks for the tutorial!!! I feel your pain with the tutorials. They take so long. BUT they are so helpful. I love this. I have never seen this type of card before. Great job and you card is so pretty. Oh my gracious Shirley, I TOTALLY love this card. Wowsers!! Beautiful card my friend. Shirley, this is one fabulous card! I love this! Your pink is awesome and what a gorgeous ribbon! Thanks so much for providing the tutorial and for visiting my blog - whoo hoo another "Carolina" gal! These are my new favorite cards to make and yours is just stunning! Your tutorial is right on the money and so easy to follow. I have been making mine 5x5 so I am bookmarking yours for another option. Have a wonderful weekend!! Your twisted easel card is stunning and what an adorable ribbon. What a super card and a tutorial to go along. I am sure that did take a while to put together but I am also sure everyone is very appreciative. Thanks for coming by my blog and leaving so many wonderful comments. Oh Ms Shirley this is gorgeous and I want you to know that I used your tutorial for my DT card over at Whoopsi Daisy this week. Thanks GF for a awesome tutorial and sharing that gorgeous eye candy. Saw your comment on my blog..thanks so much. I came to tell you that you have to get your mojo back very soon..so many count on your beautiful creativity. Rain...oh, it is been such a terrible Spring with so much rain, storms, and destruction. Maybe this will soon pass..it sure gets a person down. I'll be back to check what beauty you've made for us. What a beautiful card and fabulous tutorial. Thanks so much for sharing this Shirley. I've made easel cards before but not twisted ones so I must try this. 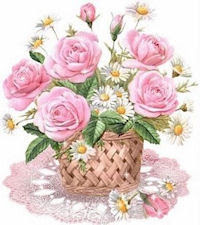 Shirley, I love pink and green together, and this neat easel card is very eye-catching. The ribbon has such a sheen to it, it makes me want to reach out and touch it! THanks for all the making-me-happy comments you left at my blog today. You're too kind! Two of my most favorite colors & you've tied it all together with one amazing bow. Beautiful work on this wonderful creation. Fabulous card and great tutorial. I can't wait to give it a try. Thanks so much for sharing. Beautiful card. I had never seen this before! LOVE it. Thanks for the tutorial, I wanna give this a try! The tutorial is wonderful, but your card, Shirley, is absolutely gorgeous! I always feel "pretty" visiting blogs where your artwork is showcased. Wish we could get together some time! NC and FL - great places to live! Shirley, this is simply gorgeous.. Thanks for the tutorial,, Im going to try one tonight.. Very lovely!! Beautiful card Shirley! Your bow is absolutely luscious!! Thanks for the clear instructions!! You rock!